For the latest issue of Red magazine, I wrote an essay for the food pages about cooking like a child. For Red’s December issue, I wrote a long-planned thank you letter to a very good friend. 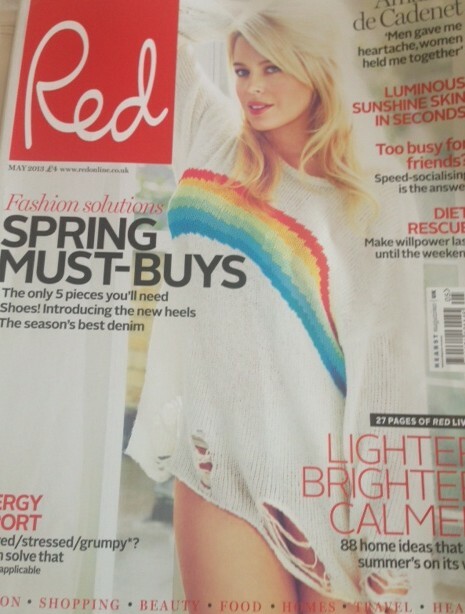 For Red’s November issue I interviewed leading consultant oncologist Dr Alison Jones. When Olivia Gordon wrote her feature for April’s issue of Red magazine on spending time alone, she asked friends what they do. Some of the answers were surprising…here’s my post about it on Red’s blog. For Red magazine’s April issue, I wrote about how much I love alone time (it’s amazing what an hour of MasterChef can do for the soul). Apparently it got a huge response from Red readers, which shows how many thirty-something women crave some precious alone-time. From the food you eat to the exercise you get, how healthy do you really think you are? And do those closest to you agree?